The Kindle Paperwhite is one of the best electronic book readers for those with macular degeneration. 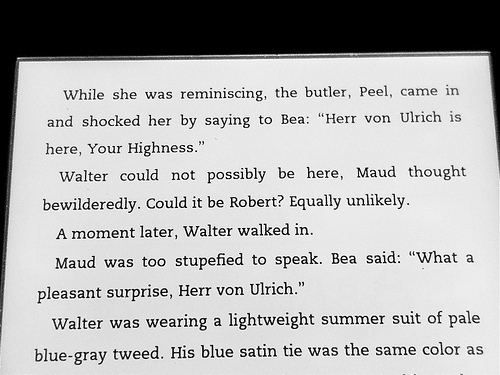 The difference in contrast and brightness (without glare) compared to the original Kindle is remarkable. Unlike the original Kindles, the Paperwhite is backlit. This means that the background is a true white and the e-ink is a nice dark black. Even with the backlight this electronic book reader does not have glare and unlike other readers like the iPad, the Paperwhite can be read outdoors or in bright sunlight. Here is a picture showing you the different sizes of fonts that are available. There are 8 font sizes. 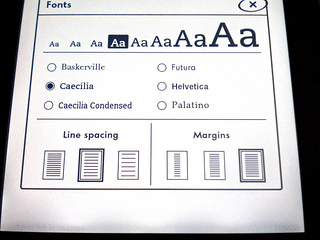 You can also choose a font style that is easiest for you to read from six different options. The Bookerly font is often a favorite that appears crisp and bold on the Paperwhite screen that allows for less eye strain. 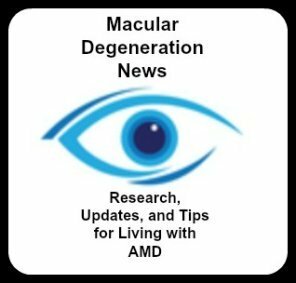 One way to make reading easier for those with macular degeneration is to increase the amount of white space between sentences and lines. Here is a picture with regular line spacing. Reading speed and accuracy improve with double line spacing and higher contrast. The touch screen is even easier to use and navigate than the original Kindles. 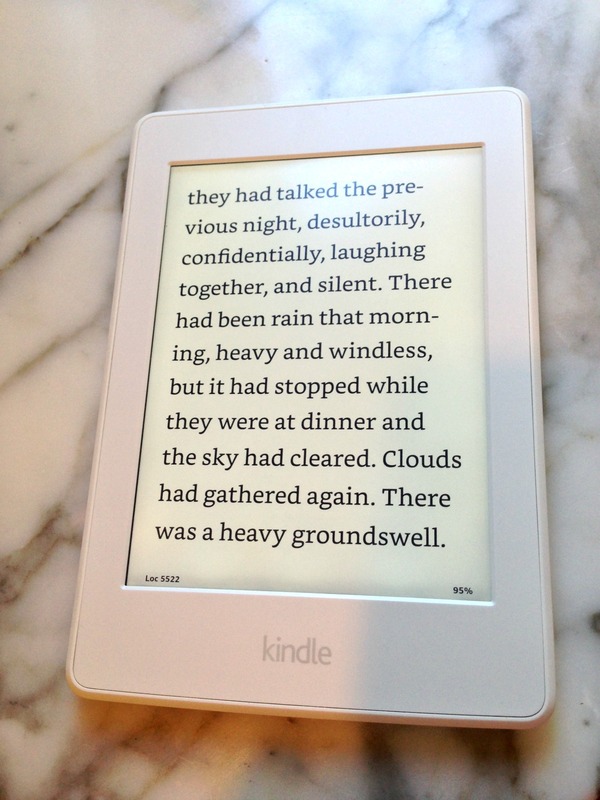 The Kindle Paperweight is lightweight and can be held with one hand. It is much more comfortable to hold for reading books than my heavy iPad. The backlight illuminates the screen so you can read anywhere. Adjust the brightness to fit your setting - if it's a dark area increase the brightness and when you are outside dim the screen. 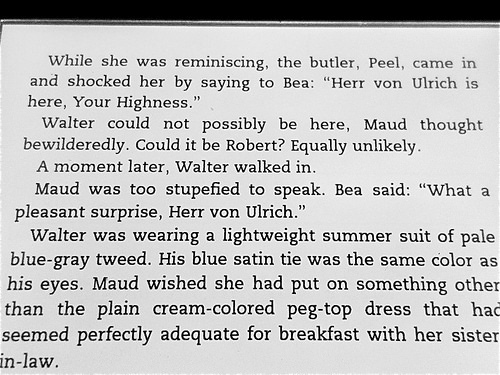 The latest Kindle Paperwhite version has a 300 PPI display which provides even crisper detailed text. For those of us who like to read while taking a bath, relaxing out by the pool or vacationing on the beach, you can now have a waterproof Kindle PaperWhite reader. You can now listen to your audio books by pairing it with bluetooth speakers or headsets. 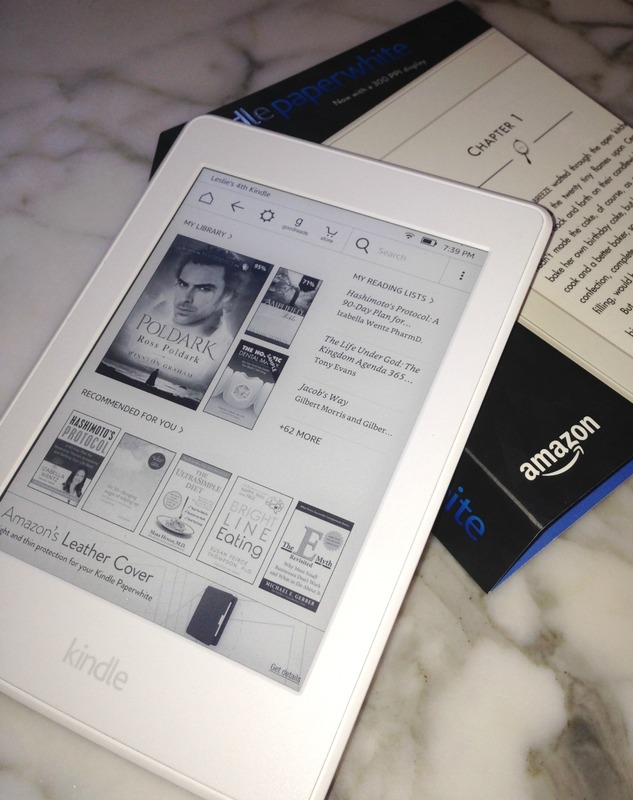 "I have been using my new Paperwhite for a couple weeks now and I love it. I have macular degeneration and was having to use a very bright lamp to read my old Kindle and having lots of problems with glare. With the lighted screen I don't even have to use a lamp. Complete freedom. I'm 84 years old and am still learning all the little tech stuff I need to know but it's coming. The adjusting font has always been a blessing too. Thank you for improving on the original Kindle to the Paperwhite." There are two options for this Kindle reader, one is WiFi and the other has the ability to download books anywhere with a cellular 3G connection. Two storage capacity options are 8 GB or 32 GB. You can find these e-readers now at stores as well as on-line at Amazon. Some of the stores that carry Kindle readers are Best Buy and Staples. I didn't realize when I bought my Paperwhite that it only comes with a USB cord so it requires a computer for charging. If you want to charge it using an outlet then you must purchase a power adapter that connects to the USB cable. This Kindle reader has an amazing battery life. It's true, I use my Kindle every day and it can go for weeks without recharging.